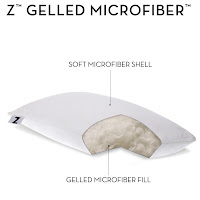 Z by Malouf Gelled Microfiber Pillow: $13.99 + Eligible for Free Shipping, Regularly $59.99! This pillow has great reviews and most everyone loves theirs. Filled with gel-coated microfibers; down alternative filling offers a traditional feel. The luxurious feel of a down-filled pillow without the allergens and smell of real feathers; antimicrobial and resistant to dust mites. Gel fibers combine to maximize softness and comfort. Consistent filling does not shift or clump and has quick loft recovery. Traditional shape fits pillowcases and compliments bedroom decor.